CLUELESS hate has weaponised a photo of AFLW star Tayla Harris into a fuel source the game will propel forward from. The action shot of the Carlton star loading up a drop punt during her side's AFLW final round match against the Western Bulldogs is actually nothing new. The 21-year-old has been snapped by photographers across three AFLW seasons executing her powerful set-shot follow through. Harris appeared on radio this morning to discuss the fallout, and said she was most concerned at the trolls who appeared with their daughters in their profile pictures. "That is the stuff that I am worried about," she told RSN Breakfast Club. "What are they saying behind closed doors, and what are they doing?" "The comments that I saw were sexual abuse. "Whether it's Victoria Police... something needs to happen." "I can see in people's profile pictures and they have women in their photos. What are these people saying behind closed doors?" "We can talk about it as much as we want but they're (the trolls) not listening, and they're probably smiling about it." The "inappropriate and offensive" comments have armed Harris and the AFLW with a "line in the sand" moment crystallising public awareness. The swift, widespread and righteous response from across the game in condemning the comments and supporting Harris has forged in the fires of social media trolling an episode that can expose, define and destroy the scary prevalence of online attacks on female athletes. It has created a banner the entire sport - and perhaps the entire country - can rally behind. In short, the trolls have given Harris and her fellow AFLW stars exactly what was needed to blow up any sentiment that online bullying is in any way accepted or normalised. As Harris pointed out in her own response to the issue on Twitter, the photo simply shows her in her place of work. The image shows the elegance, power and athleticism Harris delivers every time she steps on the field. It is this, Harris' moment of athletic legacy, that appears destined to become further normalised - that women do execute a set of skills to a freakish level when they step on the footy field, and will continue to do so. Harris made an appearance on breakfast radio on Wednesday morning where she accepted the notion the photo appears certain to become an iconic moment in the development of the AFLW - even if she shrugs off the athleticism on display in the photo captured by Michael Wilson. "I'm feeling empowered this morning," Harris told RSN Radio's Breakfast Club. "I think because of the reaction that's come, it's been a bit of a whirlwind." 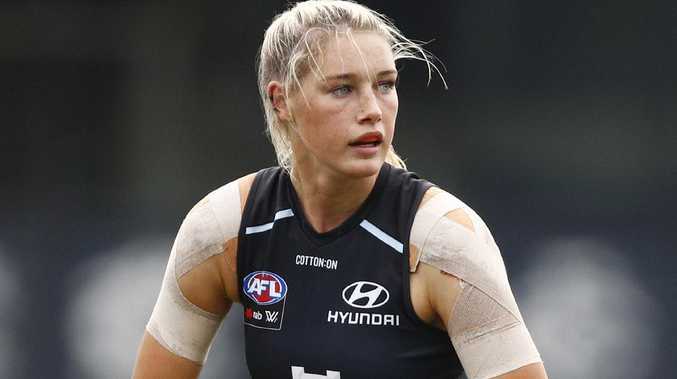 She said the overwhelming response from footy figures, including Geelong star Patrick Dangerfield, has left her further emboldened to push the cause of AFLW players like herself. "I saw that and felt warm inside," she said. "It is really amazing that the AFL community got around me." She said the issue of social media attacks on women is much bigger than the AFLW and hopes the AFL and authorities can take action to stop social media trolling ever being accepted. "It's not about me now, it's about a much bigger picture," she said. Here’s one she created earlier. "I'm happy to talk about this because I'm feeling fine now, but there's people who may have experienced things like sexual assault who would have seen this too and their reactions might be very different. "We're not talking about the trolls right now, we're talking about society right now and a much bigger picture." 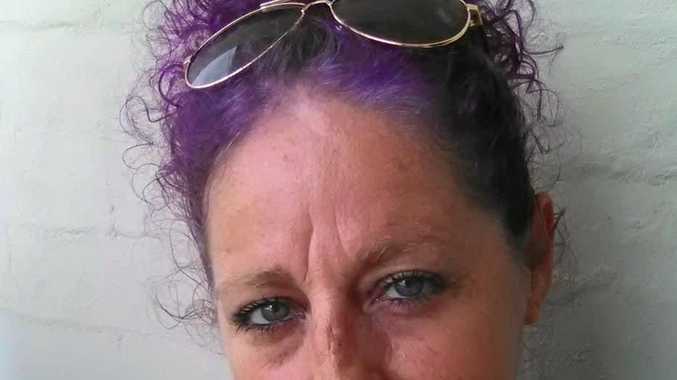 She said she has read some of the comments directed at her and said they are simply "repulsive". "Some of the comments were sexual abuse, what I would consider sexual abuse on social media," she said. "These people need to be called out by the AFL, but something needs to go further. It's something maybe Victoria Police have to look at." RSN Breakfast host and Carlton AFLW coach Daniel Harford declared the image of Harris will inspire the next generation of footy players. "This will be an iconic image of Tayla, similar to the Ted Whitten image," Harford said. "It will be an iconic photo. We've now got this next iconic photo that's going to take it to the next generation." They weren't the only ones who recognised the image as a future statue for the entire sport. Harris said she doesn't really understand the fuss behind the photo, saying her booming follow through is simply something she has always done since first playing footy as a 10-year-old. "I've seen this photo a few times, but that's how I kick," she said. "I thought it was a cool photo. I am proud of myself because the reason I can do it is that I've put so much time, money and effort into my body to allow me to do that. "I'm happy for it to be posted everywhere. Really, though, that's AFL footy and there's plenty of other cool photos out there." Meanwhile, Channel 7 has apologised for deciding to delete the post featuring Harris. The decision was widely criticised on social media. "Recently we published an image of AFLW player Tayla Harris. The original purpose in publishing the image was to celebrate the power, athleticism and skills on show in Carlton's thrilling win over the Western Bulldogs," the message read. "The image attracted a number of comments, some of which were inappropriate and offensive. As a consequence we have removed the image and the comments." The account reinstated the picture at 11.22pm with an apology. "We're sorry. Removing the photo sent the wrong message. "Many of the comments made on the post were reprehensible & we'll work harder to ban trolls from our pages. "Our intention was to highlight @taylaharriss incredible athleticism & we'll continue to celebrate women's footy." The widespread public support for Harris on social media continued on Wednesday morning and it doesn't seem like it will stop until well after Harris laces on her boots for the AFLW preliminary final between Carlton and Fremantle at Ikon Park on Saturday. premium_icon OPINION: Tayla sets the tone, but what about Dusty?